My kids and I also really enjoy camping, which of course, often requires a full day of packing, an early morning departure and hours in the car. So by the time I get to my destination, my back and hips are fatigued, my shoulders may be tense, and I feel the need to open up my body. Of course, I never remember to bring a yoga mat on these trips. I remember the hand wipes and marshmallows, the inflatable mattress and the kettle for the fire, but the yoga mat? Nope. Besides, it’s usually quite dirty and there are rocks, sticks and pine needles everywhere, which don’t get me wrong, are some of the joys of the whole adventure. But I don’t want to lie down on it or anything. Which is why I devised a Camping Yoga Set to relieve your hips that need opening and your back which needs limbering. It will also probably cause your breath to expand too, which is another challenge at high elevations. 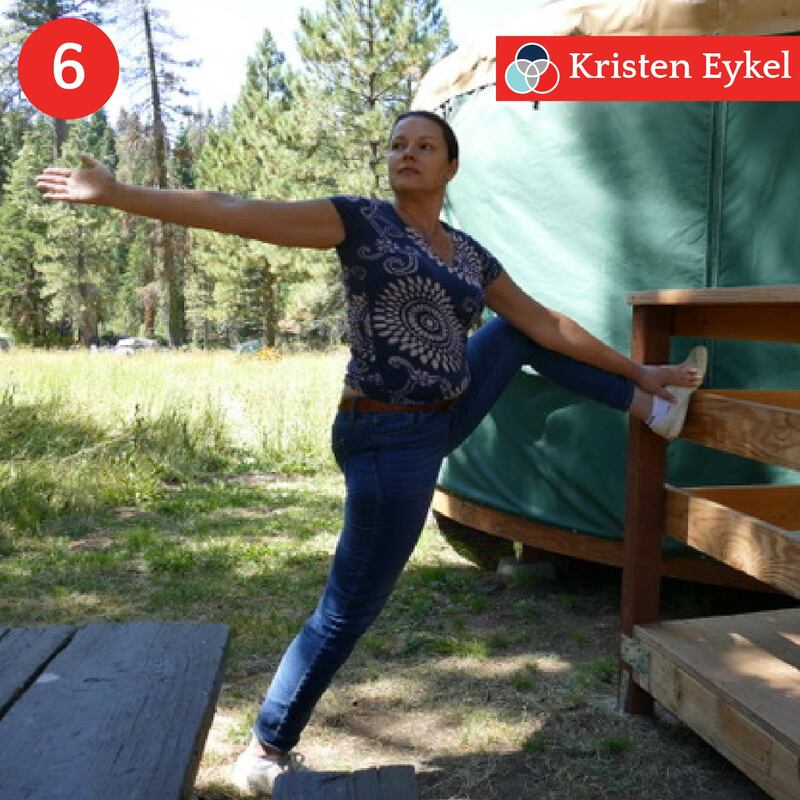 Start slowly, don’t go as high as I demonstrate if you just cannot hoist your leg up there, and breathe deeply, exhaling peacefully. You are on vacation after all, right? Start with hips squared towards your support. Hold onto the support with your hands and make sure that your footing is stable and sure. Raise your leg as high as feels good to you, (remembering that each leg will have its own needs), and plant this foot solidly on the support. Once your posture is steady and firm, lengthen your spine and pull the neck long. It may feel great to slowly raise up and down on the toe of the standing leg to deeply stretch the calf. Keep the entire leg engaged throughout each raise, so that you feel balanced and stable while squeezing the entire leg from ankle to bum. Now that you have your grounding and focus, plant the standing heel, lengthen the torso from the hips and place the palms in prayer Mudra at your heart. Rotate at the base of the spine so that your elbow can hook across your body & onto the outside edge of your bent knee, thereby rotating the entire upper body to look back over your shoulder. (Shown here is left elbow over the right knee.) Continue to stay grounded with the heel down on the earth, and do not let the standing leg rotate in the hip to compensate for spinal stiffness. We are seeking to open up tight backs and hips, not give them more strain! Move slowly and be stable in each section before moving your pose into the next variation. To go even deeper in an opposite twist, come back to center, then rotate your upper body towards the inside of your body & away from the raised knee, (shown here is left hand holding onto left ankle, & twisting open to the right) and lengthen your hand to hold on near the inside of your foot, as the other arm reaches upwards towards the sky. Let this rotation move all the way down to the tailbone and feel the lift as the arms reach wide & open your breath and heart space further. Keep your back long and do not succumb to any arching of the spine. Keep your gaze moving you upwards as you keep the twist originating from locking the left shoulder into the left knee for support. Breathe deeply into this rotation of your upper body while you release gripping in your hips or thighs. Especially at altitude, let your lungs receive a full exchange of air to help harmonize with any un-comfortability the thinner air may cause. Decide how high you desire to go. Elevating the leg to rest even higher will give you more stretch in the back of the leg and hip, plus necessitate more awareness in your overall general posture to avoid crumpling in the spine as you hinge. Next, adjust your hands in front of you so your arms are holding on, causing you to feel square across the shoulders and long in the back. You may now straighten the elevated knee and feel the stretch deeply in the hamstrings. Be aware if your lower or upper back begins to curl or arch. Avoid this tendency please, as this is simply a way to compensate for tight hips and hams, and will exacerbate back troubles while doing nothing to train your muscles to lengthen. Instead, keep the back of the neck long, and hinging only from the hips, begin to extend long over the raised leg to come into a forward fold lying on the extended thigh, hands securely supporting you in front of your body either in alignment over your head. Or reaching onto the support beneath you. A perfect counter stretch to a long day of travel, this asana is a lovely twist in an old favorite. A deep pull plus lengthening of the side and back body combine with a hip opener and deep hamstring stretch including an inversion that brings fresh blood to the head, heart, and the underside of the organs. Be sure to hold onto the support in front of you to stabilize before you twist. 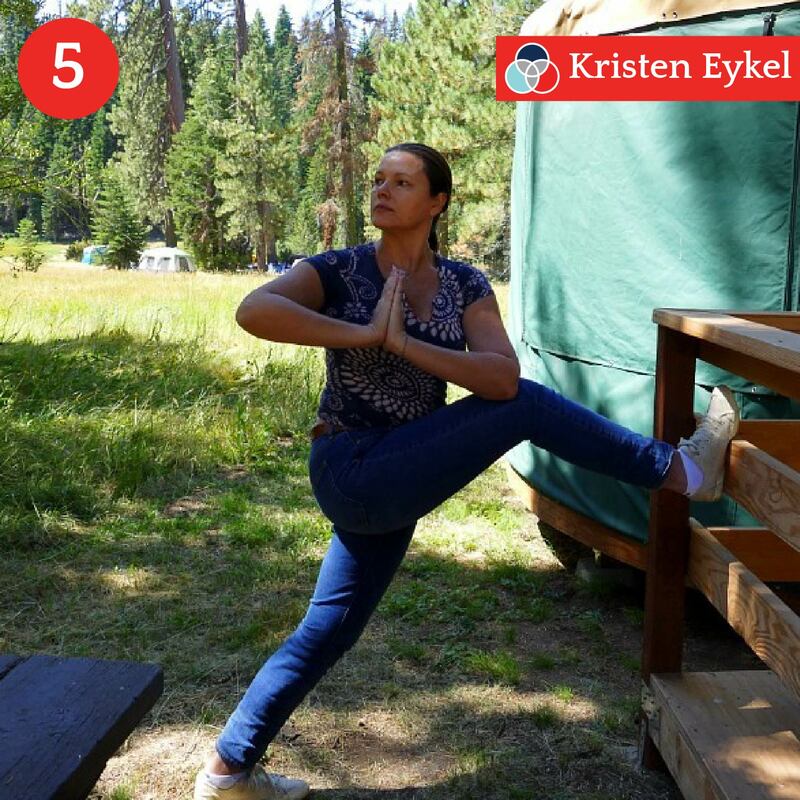 Exhale deeply and slowly as you hang forward, raising your leg with awareness before you rotate the hip. If your balance feels wobbly at any point, take a breath and relax before going deeper, or simply rotate the hip, drop the leg and come into a counter forward stretch. (or in this case Post, not Wall.) While simply folding forward and getting a great leg and lower back lengthener is fine enough in itself, I love to put a little pull on it too. This pose always pops my spine back into alignment while balancing my hips and releasing tension from my shoulders. Make sure that your feet are in straightforward alignment, evenly spaced & far enough away from the support so that you have plenty of room to lengthen the entire spine flat and long before pulling deeply. The pull is from the tailbone, not the arms. Avoid simply popping your shoulders out of socket, by leaning back and lifting the tailbone up to the sky, then melt your heart down between the upper arms. Keep a gentle, steady pull. To come out of the pose, exhale, bend the knees slightly to protect your back, and curl up on an inhale slowly to prevent lightheadedness. Use the post for support by walking in closer, to give you balance as you stand. Now that your back has elongated and your hips have opened, this same post is now the balance for your tailbone as you turn around and now head fully down into…(see next pose). Ardha Uttasana or Supported Wide Legged Standing forward fold. Your feet can be even further spread apart here, heels a little wider than your pinky toes, and your weight will be taken off your legs a little more as you relax back into the post. Be sure to lengthen your spine by elongating the ribs away from the hips while elevating the tailbone up the post even higher to open the back of the legs as much as possible before you hinge forward, This tiny, extra lift allows extra accessibility to back release for your poor lumbar that was sitting since dawn. In fact, deep exhales here while you hang down give an extra feeling of letting go into preparation for marshmallows by the fire and sleep under the stars. To return to standing, release the arms, once again bending at the knees and tucking the tailbone underneath, slowly roll back up to standing with your back melding onto the post. I like to walk my hands up my body while rolling upwards to further cement the feeling of balance. Feel yourself a bit taller now than when you started, and take a few breaths to steady yourself before stepping away from the support. Your hips, back, legs and mind should all feel more refreshed and ready to enjoy your holiday with less stiffness and mental clarity. Be prepared to repeat this session the next day too, depending upon how well you sleep at night in your sleeping bag. 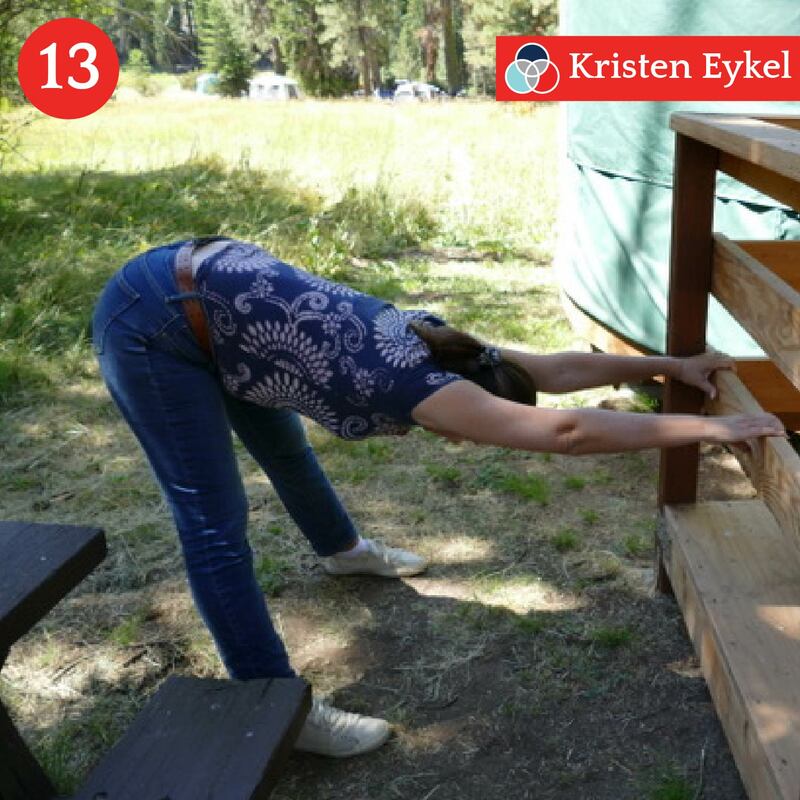 Instead of your High Lunge on the floor, pick a sturdy support, like a railing or picnic table, to become your grounding point. Make sure you are on firm, even ground. Keep the knee square to the elevated ankle and make sure both feet and both hips are in balanced forward alignment before you gently put pressure into the pose. Remember to lengthen your neck to alleviate the stress of hunching and to activate your posture, especially after a long time sitting. The spine lengthens away from the pelvis in your rotation or in your fold. This is part of what will make more space for your hips and lower back to find relief. If you want to add additional length to your pose, once in the balance, slowly elevate & lower the heel from the earth & stretch the entire length to get the blood flowing through your tired limbs again. 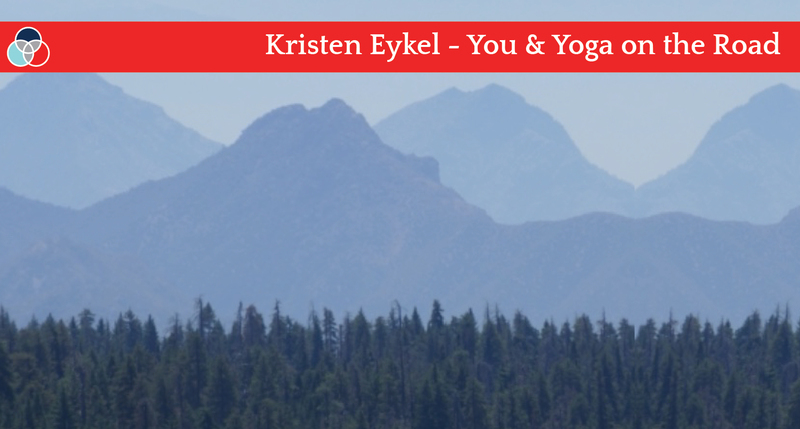 Photos were taken at Sequoia National Park – Photo credit – Kira Selzer. Great idea and tips Kristen, thanks!